Sgurr nan Conbhairean lies in the centre of a ridge of mountains surrounding a great corrie, hence its E face is rocky and steep. 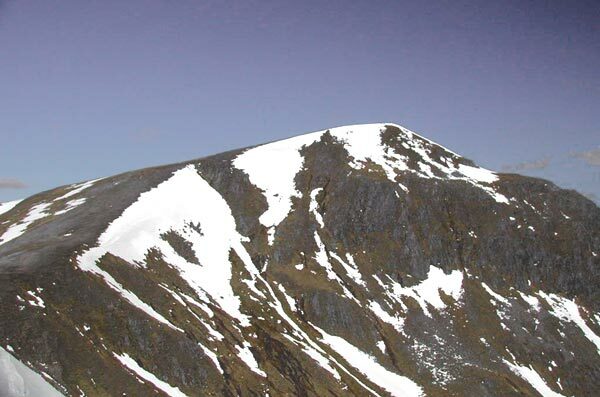 The summit cone of Sgurr nan Conbhairean lies close to the corrie edge and its narrow ridges lead N to Sail Chaorainn and SE to Glas Bealach leading to Carn Ghluasaid. 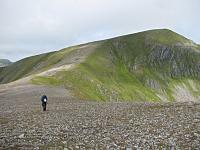 A third ridge leads SW to Drochaid an Tuill Easaich (1001m) then branches NW to Bealach Choire a' Chait and S to Meall Breac. The S ridge leads to the path from Strath Cluanie, by the Allt Coire Lair, and is the normal ascent route. Heading along wind-scraped terrain from Carn Ghluasaid to Sgurr nan Conbhairean. Sgurr nan Conbhairean (right) with sunlit Sail Chaorainn beyond to left of centre, seen across Loch Cluanie from the summit of Aonach air Chrith. Sgurr nan Conbhairean from Carn Ghluasaid. 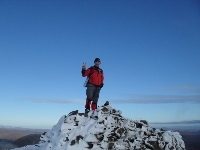 The summary information of one or more ascent routes that include Sgurr nan Conbhairean. 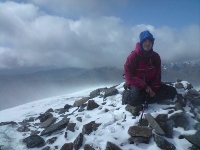 1 1470 m 16.72 km 6 hrs Sgurr nan Conbhairean, Sail Chaorainn and Carn Ghluasaid Moderate route with steep slopes and rocky ridges on the north side of Glen Shiel. 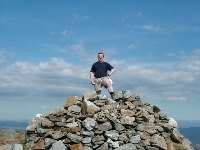 The massive cairn at the summit of Sgurr nan Conbhairean. 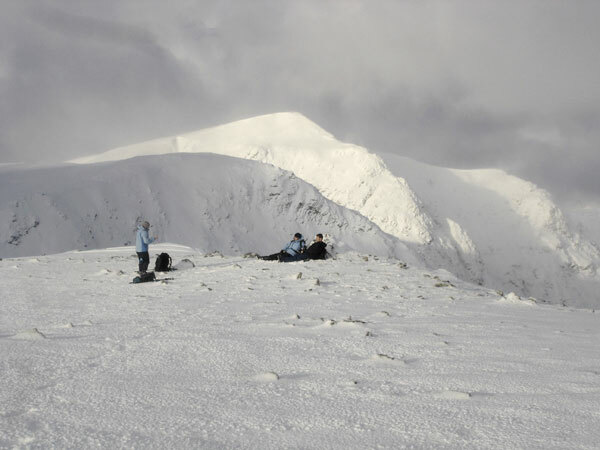 Post a few words about Sgurr nan Conbhairean or read what others have had to say. These mountains come highly recommended if you enjoy NOT meeting other people! 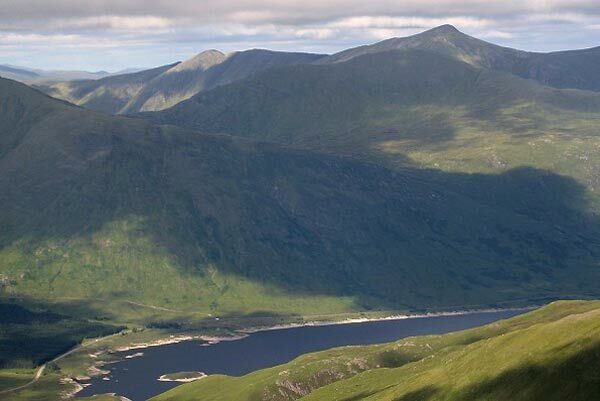 As most guide books and therefore other walkers overlook the area in favour of Kintail, it is an ideal spot for spending an isolated night or two camping on the tops. Rather than park at Lundie, leave the car in one of the couple of laybys about 800m east of Cluanie dam and head up north-west from there. It's boggy for the first couple of K and rocky in places, but once near the tops, there are lochans and numerous hollows to leave the tent. The E-W ridge although wide, is long and ruggedly scenic.